Exhibit visitors try to hold a conversation as nearby speakers play distracting voices. Image courtesy of the Science Museum of Minnesota. At the Science Museum of Minnesota, you can run a virtual race against a T. rex, create a tornado out of water mist, and visit a real Egyptian mummy. You can also shred your worries. The Worry Shredder sits at the center of a new exhibit, Mental Health: Mind Matters, that aims to create a safe space for discussions about mental illness. Visitors can write their worries on a piece of paper, insert it into the machine, and then watch their worries be shredded into oblivion. It’s not your typical science museum exhibit. 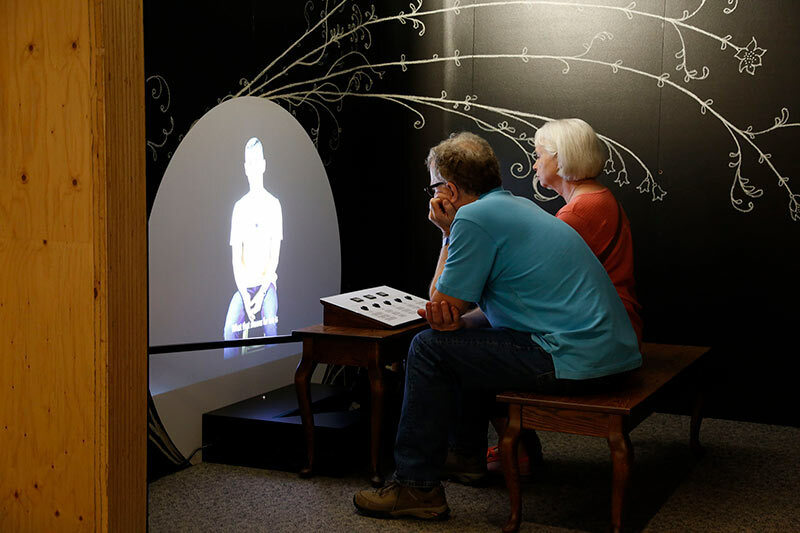 “We wanted to raise awareness—in a safe, comfortable manner— about mental health,” says Cari Dwyer, director of exhibit project management at the Minnesota Science Center and project lead on the new exhibit. “Mental health is a part of our overall health. And, like physical illness, mental illnesses are not a ‘choice’ or a personal flaw but medical conditions that require care,” she said. The stigma attached to mental health issues may be receding in general, but that doesn’t mean the struggles are easy to talk about—especially when they are personal. Unfortunately, the climate and expectations in many physics departments make conversations about post-traumatic stress disorder, depression, anxiety, eating disorders, addiction, and other personal challenges difficult. This can leave already struggling people feeling even more isolated. 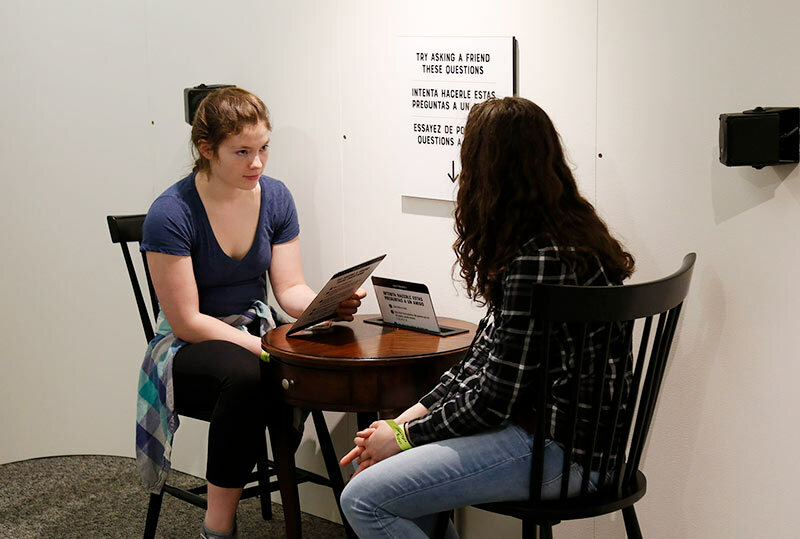 With this in mind, we asked some physics majors to visit the new exhibit and then to bring us, the SPS community, into the conversation about mental health by sharing their reflections here. Exhibit visitors watch real people talk about living with mental illnesses. Image courtesy of the Science Museum of Minnesota. As I shredded a paper with the words “Will there be a job for me?” written on it, I wondered what I would have written as an elementary schooler with undiagnosed severe social anxiety. Would visiting this exhibit at that time have changed how my mental illness developed, or the ways I learned to cope? Would I have talked about my anxiety with my mom if we’d been there together? We live in a society where experience is in high demand, and it seems like you can never be too overqualified. In physics and astronomy, you can never have too much research experience, take too many advanced courses, or know too many programming languages. Over the years, I’ve felt increasing pressure to make sure I’m doing everything I can to make myself competitive for whatever lies next, to the point where I’ve felt close to burning out on multiple occasions. I have lived with high-functioning anxiety ever since I can remember and was not surprised to learn that one in five Americans live with an anxiety disorder. I didn’t openly talk to my parents about my anxiety until I was in college. Part of me never felt like it was bad enough to warrant bringing it up. In addition, my anxiety drove me to be competitive and do well academically. To remove a driving force of that success felt like it would change who I was. As with many mental health disorders, anxiety is often invisible— especially if you choose not to see it. But silence is one of the most dangerous things you can do with a mental health disorder. The good news is that talking about mental health issues seems to be increasingly acceptable. As institutions like the Science Museum of Minnesota provide safe places for people to explore and learn, it becomes easier for people who do not live with these disorders to empathize, sympathize, and understand these issues. It also provides the vocabulary to do so, for those new to the conversation. I am lucky enough to attend an institution that has accommodations for mental health issues; not everyone has access to that privilege or is in a place where they feel comfortable obtaining help. In many instances, stigma—societal, self-imposed, or otherwise—can be a huge hindrance to recognizing or managing a mental health disorder. Continuing to normalize the subject is a step in the right direction. In one of the most memorable activities, I sat in a chair across from another person and had a small speaker near my ear. As I tried to talk to the person sitting across from me, a woman’s voice yelled into my ear from the speaker, saying phrases like “Why are you laughing?” and “Keep your eyes DOWN.” The voice was so distracting that it was hard to answer easy questions like “What day is it today?” This was a simple but powerful demonstration of the unseen challenges people struggling with schizophrenia or bipolar disorder may have to manage. As I moved through Mental Health: Mind Matters, I became a bit overwhelmed. It took me the rest of the night to really digest what I was seeing. The exhibit reminded me that mental illnesses can take very different forms, and some people may hide symptoms instead of getting the treatment they need and deserve. We can all help each other by watching out for the signs and symptoms in ourselves and those around us, encouraging people who are struggling to get help. Sometimes, their stark descriptions make mental illnesses sound scary or make you believe that a normal life could never be possible. One Mental Health: Mind Matters station played interviews of people describing their experience living with a particular mental illness. This approach made learning about mental illnesses much more meaningful to me. Hearing their voices helped me understand, on a more personal level, the struggle (or ease) of living with a mental illness. After visiting this station, I felt less intimidated by mental illnesses that were unfamiliar to me, like schizophrenia and dissociative identity disorders, and I felt much more capable of connecting with someone that has a mental illness. There are people very close to me who have experienced anxiety and depression, some who have expressed thoughts of suicide. It is unsettling to imagine the pain and frustration associated with these conditions, but normalizing mental illnesses by talking about them, sharing experiences, and being there for others when help is needed will benefit everyone. Living with a mental disorder does not make someone any less passionate or capable. It shouldn’t stop anyone from achieving their goals—in physics or beyond.